Melt-in-your-mouth slow-braised short ribs tacos with sour cream, guacamole, pickled red onions and fresh chillies is the perfect recipe for entertaining. Place the short ribs and onions in a large oven-proof dish and season with the paprika, NoMU rub, salt and pepper and pour over the stock. The ribs need to be just covered with the stock. Cover with foil/a lid and place in the oven. Allow to braise for 3-4 hours until the meat falls off of the bone. When the beef is cooked, remove from the oven and remove the short ribs from the braising liquid. Reserve 2 cups of the braising liquid and discard the rest. Place the reserved liquid in a small saucepan over medium heat and allow to reduce for 10 minutes. Allow the ribs to cool a little before removing the meat from the bones. I also remove the very fatty/chewy pieces as this isn’t pleasant to eat. Mix the short rib meat with the reduced liquid and set aside. To make the ‘quick-pickled’ red onions, heat the vinegar, sugar and salt in a microwave-safe container for 2 minutes and stir to ensure the sugar has dissolved. Pour the hot vinegar over the sliced onions and allow to sit for 10 minutes. 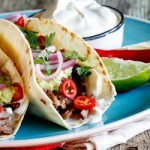 To serve the tacos, spread some sour cream on a soft taco, place a few spoonfuls of the short ribs followed by guacamole, red onions and finish with fresh chillies and coriander.